The Saber Marching Band, led by Brenda Baldos, holding a banner on the left, and Lindsey Oyama, marches in the Maui County Fair Parade. 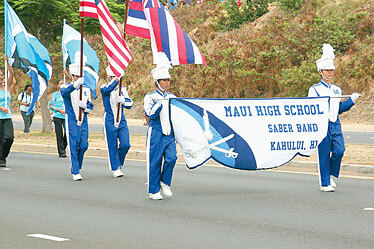 The Maui High School Saber Band is the largest organization on campus, and some may say that it is the best campus organization as well. Recently it has earned several prestigious honors. "To make a band successful, you need discipline and desire because if you want something, you'll go for it and you'll stop at nothing to get it," said Zoey Martinez, the marching band's senior drum major. Martinez and Marvin Rambaua, the other drum major, led the Saber Marching Band to victory at the Kamehameha Schools Tournament of Bands, held in November at the Kapalama campus . The Saber Band was awarded five first-place trophies for its performance in percussion, visual performance, general effect, color guard and drum major categories. The band also received a division rating of "excellent." To receive this rating requires a great deal of teamwork, practice and dedication. Few bands receive ratings of "excellent" or "superior." The band also took third for music performance, while senior trumpet player Chris Ponce won second place for solo performance. "When I heard the color guard had won first place, I was so proud," said Kimberley Kuni- shige, a member of the guard. "We worked so hard and it all paid off." That night, a judge noticed that Maui High School generated the largest cheers from the crowd. "It seemed that everyone supported our band from all the islands," said Adrian Manuel, a sophomore mellophone player. "We even had cheers from other schools, like our friends at Kapolei High School." The MHS band is a traveling band. Band members went on a trip to perform at Disneyland during spring break last month. Several members have been invited to play in the Maui All-State Marching Band, which will perform at the Rose Bowl Parade in Pasadena, Calif., on New Year's Day. The band's performance will feature Polynesian dancers, percussion and color guard. Two days before the Rose Bowl, the band also will perform at the Magic Music Days Parade in California. Last year the Maui band was invited to perform for TV Land's "High School Reunion" show, which began airing on March 5. The Maui High School band program consists of 170 students and has four separate bands: Concert, Symphonic, Marching and Pep. For marching band, general practice begins in July with a week of band camp. Band members learn to play memorized music, march and stay in formation. Three days a week, the band stays after school for up to three hours practicing for competitions and its regular performances at football games, the Maui County Fair Parade and the school's homecoming. "Being a part of the band creates better students, better members of society and the best musicians in the world," said Chaclyn Barut, a senior and the band council president. The Saber Band has helped students develop close friendships and confidence within themselves. The band members help generate school pride and really show their Saber spirit. "I would want to be able to teleport to any place because it saves airfare." "Food zapping. Since I'm a fatty, I'd zap food every single moment I'm hungry." "To have an ability to be invisible because then I could just sneak up on anyone's conversations to find out the truth about things." "The power to read peoples' minds. I could use this as an advantage by reading their thoughts so I could help them with their problems and find out the truth." "I wish I could change my age and how I look whenever I wanted to. Then I could be young when I wanted and older when I wanted." "I would want to control the weather because if I was tired and didn't want to go to school, I would make it rain until Maui High closed down."